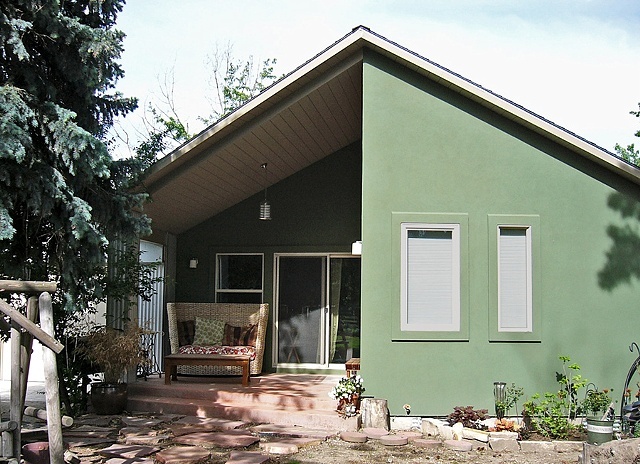 This rear view is of a bedroom and family room addition to a house in Boise, Idaho. The scope also included a new bath and garage addition, as well as the layout for the kitchen remodel. The patio and bedroom wall angle out approximately 10º and the roof has photovoltaic panels. Exterior finishes include stucco and Galvalume corrugated metal. Interior finishes consist of sustainable materials including quartz counter tops, bamboo plywood cabinets, a Marmoleum kitchen floor, and a cast bath vanity with fly ash content. All were were specified by the owner in the spirit of the sustainable design concept.